The tagline on the webpage says “Look your Sunday best! Guaranteed to help you be worthy and get noticed by the King of Kings”. You can also get a “Looking good for Jesus” shopping bag, bubble bath, hand cream, coin purse compact mirror and mini kit. Um, yeah. OK. They also have a line called “Wash your sins away” which includes towelettes, breath spray, lip balm and, of course, bars of soap. So what do y’all think about this sort of thing? Obviously, the people making this are going for cheeky, perhaps trying to be provocative, definitely working on irreverent. I actually heard about this product line because of a news item reporting that it had been pulled from stores in Taiwan after complaints from Christian customers. I wonder if it’s being sold anywhere here in the USA and if so, if anyone’s complained. In his book The Poet and the Peasant and Through Peasant Eyes by Kenneth Bailey there is a lovely explanation of this woman’s actions that I think can speak to us today about how to deal with insults and slights against our Lord. I just love this. The impulses behind “Looking Good for Jesus” lip balm is nothing new. 2000 years ago men like Simon were already seeking shocking ways to demonstrate that Jesus is inferior, not to be taken seriously or even afforded basic respect. It’s so easy to become indignant and outraged. Yet, how often is that all we do? If this woman had called out her outrage or stormed off in protest, no one would remember her. Instead, she rushes forward to honor, love and serve Jesus. And now she is remembered through the ages. And in doing so, she provides Jesus with a chance to demonstrate who he is (by telling her that her sins are forgiven at the end of the story, Jesus identifies himself with God since only God has the power to forgive sins). 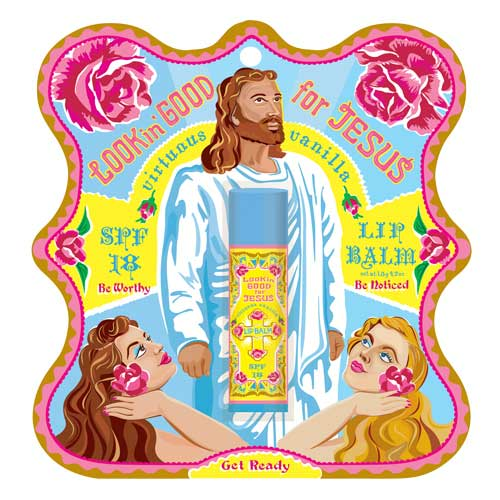 So, let’s see “Looking Good for Jesus” lip balm not as another opportunity to display righteous anger. Or even as a chance to prove that we’re open minded and hip enough to laugh at or ignore such things. Let’s take it as a challenge to serve our Lord wildly and boldly as this prostitute did so many years ago. When we do, we can trust that like her, we will be opening a door for God’s kingdom to be revealed more and more. « Older Post “RAM” Voters	» Newer Post The Carnival of Homeschooling Is Up! I am so hurt.. I cant believe this. None of this is right! Every Christian should be appalled and disgusted at this blasphemy! We let too many things go. We need to stop this madness and fight against SELLING JESUS!!! My Lord is NOT FOR SALE! We need to be angry! Isn’t this what Jesus did when he torn up the money changers at the temple! John 2:13-16 Stand up and fight for whats right! To be angry at this is righteous! I don’t care if I’m alone Im gettin this taken down some how. Email me if you want this “lookin’ Good for Jesus” mess taken down!